Until the late nineteenth century coal was mined underground using a pick and shovel, and children were often employed underground in dangerous conditions. Coal-cutting machines were introduced in the 1880s. By 1912, surface mining was conducted with steam shovels designed for coal mining. Coal that occurs at depths of 180 to 300 ft (55 to 90 m) are usually deep mined, but in some cases surface mining techniques can be used. For example, some western U.S. coal that occur at depths in excess of 200 ft (60 m) are mined by the open pit methods, due to thickness of the seam 60–90 feet (20–25 metres). Coals occurring below 300 ft (90 m) are usually deep mined. 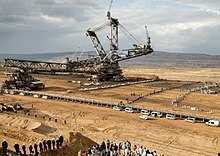 However, there are open pit mining operations working on coal seams up to 1,000–1,500 feet (300–460 metres) below ground level, for instance Tagebau Hambach in Germany. Most coal seams are too deep underground for opencast mining and require underground mining, a method that currently accounts for about 60 percent of world coal production. In deep mining, the room and pillar or bord and pillar method progresses along the seam, while pillars and timber are left standing to support the mine roof. Once room and pillar mines have been developed to a stopping point (limited by geology, ventilation, or economics), a supplementary version of room and pillar mining, termed second mining or retreat mining, is commonly started. 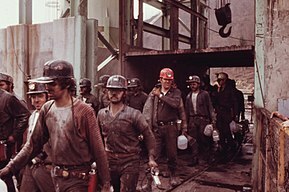 Miners remove the coal in the pillars, thereby recovering as much coal from the coal seam as possible. A work area involved in pillar extraction is called a pillar section. Coal reserves are available in almost every country worldwide, with recoverable reserves in around 70 countries. At current production levels, proven coal reserves are estimated to last 147 years. However, production levels are by no means level, and are in fact increasing and some estimates are that peak coal could arrive in many countries such as China and America by around 2030. Coal reserves are usually stated as either (1) "Resources" ("measured" + "indicated" + "inferred" = "resources", and then, a smaller number, often only 10-20% of "resources", (2) "Run of Mine" (ROM) reserves, and finally (3) "marketable reserves", which may be only 60% of ROM reserves. [ clarification needed] The standards for reserves are set by stock exchanges, in consultation with industry associations. For example, in ASEAN countries reserves standards follow the Australasian Joint Ore Reserves Committee Code ( JORC) used by the Australian Securities Exchange. However, in lesser developed countries and some developing countries, many miners continue to die annually, either through direct accidents in coal mines or through adverse health consequences from working under poor conditions. China, in particular, has the highest number of coal mining related deaths in the world, with official statistics claiming that 6,027 deaths occurred in 2004. To compare, 28 deaths were reported in the US in the same year. Coal production in China is twice that in the US,  while the number of coal miners is around 50 times that of the US, making deaths in coal mines in China 4 times as common per worker (108 times as common per unit output) as in the US. Noise exposures vary depending on the method of extraction. For example, a study has found that among surface coal mine operations, dragline equipment produced the loudest sound at a range of 88-112 dBA. Within longwall sections, stageloaders used to transport coal from the mining face and shearers used for extraction represent some of the highest noise exposures. Auxiliary fans (up to 120 dBA), continuous mining machines (up to 109 dBA), and roof bolters (up to 103 dBA) represent some of the noisiest equipment within continuous mining sections. Exposures to noise exceeding 90 dBA can lead to adverse effects on workers' hearing. The use of administrative controls and engineering controls can be used to reduce noise exposures. Surface mining of coal completely eliminates existing vegetation, destroys the genetic soil profile, displaces or destroys wildlife and habitat, degrades air quality, alters current land uses, and to some extent permanently changes the general topography of the area mined. This often results in a scarred landscape with no scenic value. Of greater concern, the movement, storage, and redistribution of soil during mining can disrupt the community of soil microorganisms and consequently nutrient cycling processes. Rehabilitation or reclamation mitigates some of these concerns and is required by US Federal Law, specifically the Surface Mining Control and Reclamation Act of 1977. Mine dumps ( tailings) could produce acid mine drainage which can seep into waterways and aquifers, with consequences on ecological and human health. The People's Republic of China is by far the largest producer of coal in the world, producing over 2.8 billion tons of coal in 2007, or approximately 39.8 percent of all coal produced in the world during that year. For comparison, the second largest producer, the United States, produced more than 1.1 billion tons in 2007. An estimated 5 million people work in China's coal-mining industry. As many as 20,000 miners die in accidents each year. 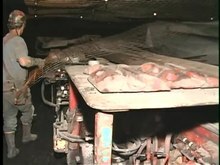 Most Chinese mines are deep underground and do not produce the surface disruption typical of strip mines. Although there is some evidence of reclamation of mined land for use as parks, China does not require extensive reclamation and is creating significant acreages of abandoned mined land, which is unsuitable for agriculture or other human uses, and inhospitable to indigenous wildlife. Chinese underground mines often experience severe surface subsidence (6–12 meters), negatively impacting farmland because it no longer drains well. China uses some subsidence areas for aquaculture ponds but has more than they need for that purpose. Reclamation of subsided ground is a significant problem in China. Because most Chinese coal is for domestic consumption, and is burned with little or no air pollution control equipment, it contributes greatly to visible smoke and severe air pollution in industrial areas using coal for fuel. China's total energy uses 67% from coal mines. 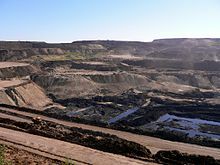 An open-pit coal mine in the Rhineland lignite mining area ( Germany). South Africa is one of the ten largest coal producing countries   and the fourth largest coal exporting country  in the world. ^ a b Louie, Edward P.; Pearce, Joshua M. (June 2016). "Retraining investment for U.S. transition from coal to solar photovoltaic employment". Energy Economics. 57: 295–302. doi: 10.1016/j.eneco.2016.05.016. ^ " Coal Mining Steeped in History". ABC News. 5 January 2006. Hamilton, Michael S. Mining Environmental Policy: Comparing Indonesia and the USA (Burlington, VT: Ashgate, 2005). ( ISBN 0-7546-4493-6).